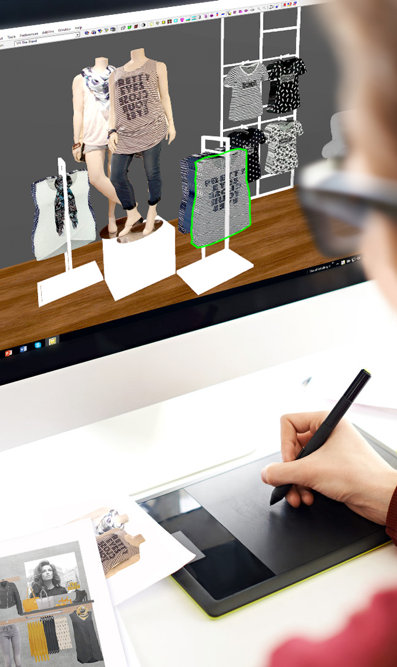 Create 3D store mock-ups and get visual product range analysis. Develop visual merchandising guideline and planograms to help you save time and drive sales. MockShop turns business intelligence into a visual. Our software streamlines the visual merchandising process, stomps on miscommunication between staff and head office, and keeps revenue at the forefront of any visual merchandising decision. Essentially, MockShop is a database of your product lines, all cleverly linked to individual images of the items. It allows you to put entire product lines into a manageable perspective – then you simply drag and drop to build the store of your dreams in 3D. Share the resulting ‘planogram’ with your team, for a clear, undisputed direction on the layout you want. Retailers tell us what used to take them weeks now takes just days and using ShopShape great helps aid in store compliance. Even better, by linking stats and values to product images, revenue and profitability can be front of mind during visual merchandising. Bonmarché is the UK’s largest womenswear value retailer. Headquartered in Wakefield, the company has the ambition of being the most preferred and recommended multi-channel retailer for women over 50. With 330 stores – and opening new stores and outlets across the UK – it’s sometimes difficult to maintain a brand image. For Bonmarché, these efforts start with visual merchandising. Be prepared and complete your VM plan before stock arrives, using photos of samples or CAD drawings. Share ‘planogram’ PDFs or images easily with staff for consistent execution and customer experience across all stores. Visual range analysis enables filtration of product collections based on criteria such as colour, price and type. No more spreadsheets - gain a complete visual overview of your product ranges. Get a top-down view of how your store is laid out with crucial statistics such as square foot and cost included. Easy to follow and highly visual. Create unlimited 3D stores and use the easy drag-and-drop interface to plan effectively. Includes all of your fixtures, shelving, products and graphics for an accurate representation. Images, 3D objects and sketches can be easily imported using your existing data, and then linked to each product. Search your product range by colour, style, season or profit margin. Publish to ShopShape and ensure VM compliance every time. By linking stats & figures to products, it’s easier for employees to make the right decision around stock choice and revenue lines. Use the product information to plan your layout to turnover the products you need to (ie profit, season or levels of stock). Use your backend information from the database to guide your future-planning decisions. Real time heat mapping. Overlay your 3D mockups with heat mapping displaying sell-through data: price, sold quantity, and much more. Deliver more relevant guidelines to field teams by grouping store clusters. Create digital mock up stores instead of physical ones. Increased sell through from improved stock management (no overstocking). Digitally test product density in a 3D environment and avoid overspend. Simple integration with your existing IT systems. Create visual storyboards of your product collections before the 'buy'. Visualise your range with actionable and deeply integrated product data. Get an overview of your product range in a realtime 3D environment. Preview PoS material and signage in a 3D store environment. Instantly create storyboards to preview products and range with ease. With MockShop, all of your product data is highly visual, making it easier to plan, manage and execute better collections for your stores. Create interactive 3D stores simply by dragging and dropping fixtures and products in MockShop's powerful virtual environment. Want to see MockShop in action without having to travel? We’d love to run you through how this software works.